Our computers have a list of everyone in the country without an identity card. If you haven't registered, it's only a matter of time before we knock on your door. Remember "Security is Freedom". There are many ways to pay for your identity card, so there is really no reason not to register now. 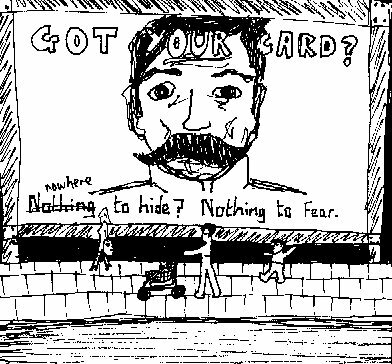 "Nothing to hide, nothing to fear", that is our promise. As long as you hold a current, valid* identity card, you have nothing to fear. Did you hear the one about the new comedian? No? That's funny. Seriously though, the stand-up comedian Bob Harmless will soon be entertaining us with his wholesome jokes and funny incidents. Bob says, if you have any funny incidents or jokes about string etc. please send them in, the more the merrier! "You'll forget yourself with Bob Harmless"
He should be moderately shot. Why don't they riot about this? We should never apologise to clerical fascists, it's none of their damn business what we print, read or write. They are the last people who would ever deserve any respect (see above). If you are not a follower of a religion, the rules of that religion do not apply to you. If they try to force them on you, just say no. Are we to have a silhouette instead of a picture in a sequence depicting Arab rulers? Here is Caliph A, in typical costume, here is a blank space because we can't show you what we think this guy looked like, and here is Caliph C in his grandeur. It's preposterous. If the rabbit disease myxamatosis were to mutate to a human form, it could virtually wipe out the population of Britain, it is thought. There is speculation here that rabbits might deliberately try to contaminate human food and drink, as a result of a previously unknown group defence instinct. Identity cards are about one thing only, control. 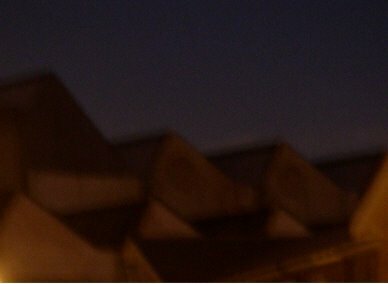 The government wants to control you, to tag you with Oyster cards and car tracking, to watch you on surveillance cameras, and to decide your entitlements and ultimately whether you live or die. They are already persecuting you, revoking your ancient rights, selling you out to big business. But you are wild, and you should be free. They want to tame you. Don't lose your birthright as a free creature of your own land. Resist those who would corral and enslave you. Do not become like sheep and cattle. In case you didn't get that nice allusion, the current Rimmel girl is one Ms Kate Moss, whom he nearly landed across the road in Holloway. "Jingle jangle of the gaoler's bangle" - do you think he's read Borstal Boy? They're back and this time it's impersonal. Purchased at 7:15 a.m, minus 4 degrees Celcius outside a London underground station from a merry chap calling on commuters to support the Gate Gourmet strikers. 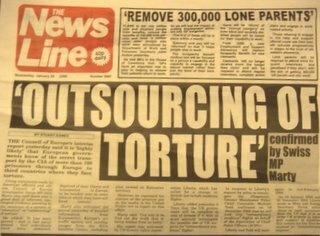 We had "Outsourcing Torture" as a headline some days earlier. 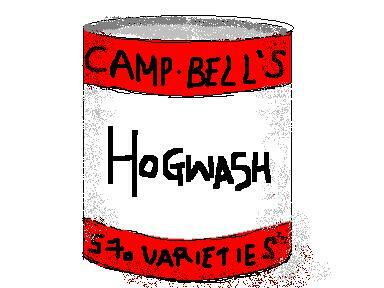 Alistair Campbell is so far up himself it's grotesque. People with such pervasive delusional traits, including him and that other poodlefaker Tony Blair, should be debarred from any responsible position in public life. I appeal to your readers to realise that the use of non-rotary mowers is forbidden on pain of death by the Willesden Rotary Mower Club. Worshippers at WRMC High Temple were reminded by Her Eminence, Engineer Alma Dinnerjacket this Monday (our Sabbath), of the verse in the Holy Manual which permits believers to put to death users of both petrol and hover mowers alike. We hold it self-evident that the use of non-rotary mowers is highly offensive to every single one of our followers, and therefore we claim our right under the relevant legislation not to be offended. I urge all citizens of this contingent state to desist from further provocations, until the Day of Lawn when all will be judged by Prince Rotor (praise be His name). "The revelation that Mr Blair had supported the US president's plans to go to war with Iraq even in the absence of a second UN resolution contrasts with the assurances the prime minister gave parliament shortly after. On February 23 2003 - three weeks after his trip to Washington - Mr Blair told the Commons that the government was giving 'Saddam one further final chance to disarm voluntarily'. He added: 'Even now, today, we are offering Saddam the prospect of voluntary disarmament through the UN. I detest his regime - I hope most people do - but even now, he could save it by complying with the UN's demand. Even now, we are prepared to go the extra step to achieve disarmament peacefully.'" Despite your outrageous heightism, I would be very happy to take up your case with the Council re speeding traffic on All Souls Avenue. Would you mind contacting me with further details about the incident(s) and your contact address so that I can do this? Do you think they'll wake Sharon up now?